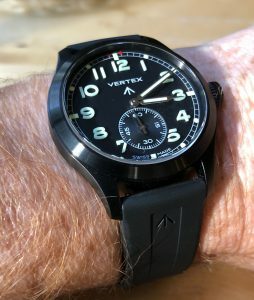 After reviewing and enjoying the original Vertex M100 I was intrigued to experience the limited edition blacked out version. I am sure I have read a comment from Don Cochrane of Vertex that this watch was how he imagined the dirty dozen watches might have evolved. The blacked out look making the watch even more appropriate for stealthy military operations. There is certainly no doubt that the black DLC coating does give a more modern look, especially on the superb, and subtly branded, rubber strap. Aside from this particular watch I had been eyeing black cased watches for a time attracted by their purposeful modern. However whilst considering the merits of the M100B I realised that for me, black is not particularly new. So this brings me to my first observation, the DLC finish does actually look more stealthy. 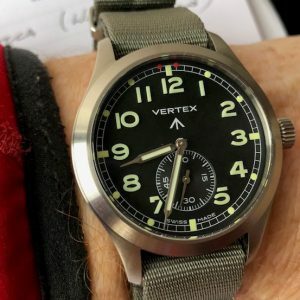 On the first morning of wearing the Vertex ,my usually attentive wife, did not notice the watch at all, when I bought it to her attention she said she had thought I was wearing the Swatch on the right in the picture above. Now for some of us that might like to keep our growing watch collections less evident, this could be a bonus feature. Like the original watch this one comes packaged in a Peli case with three straps – however in place of the leather strap there is a bespoke Vertex rubber two-piece strap. The two Vertex nylon NATO-straps this time are in Red with black DLC metal parts and all Black. The star strap has to be the new rubber one. It is super comfortable and very “elegant” exception to what I was used to expect from rubber straps. I especially like the very subtle branding. 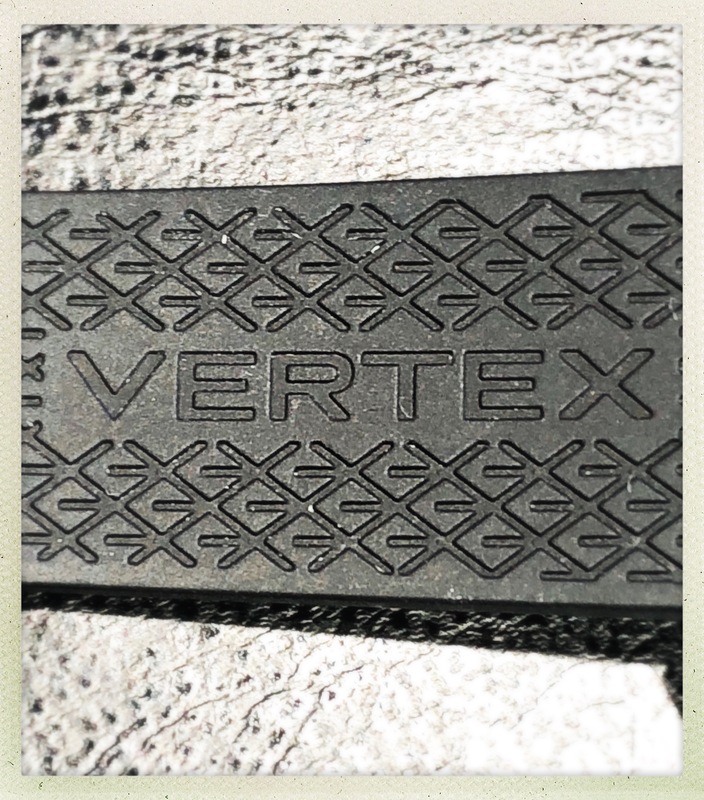 The Vertex arrow featuring on the top near to the lugs and as a grippy looking pattern on the underside. Only 150 M100B timepieces will be produced and when I checked last week there are still some available at £2624.40. Unlike the M100 no referral is required. The other specifications remain the same as the original. A 40mm case housing a ETA 7001 movement with a solid caseback. 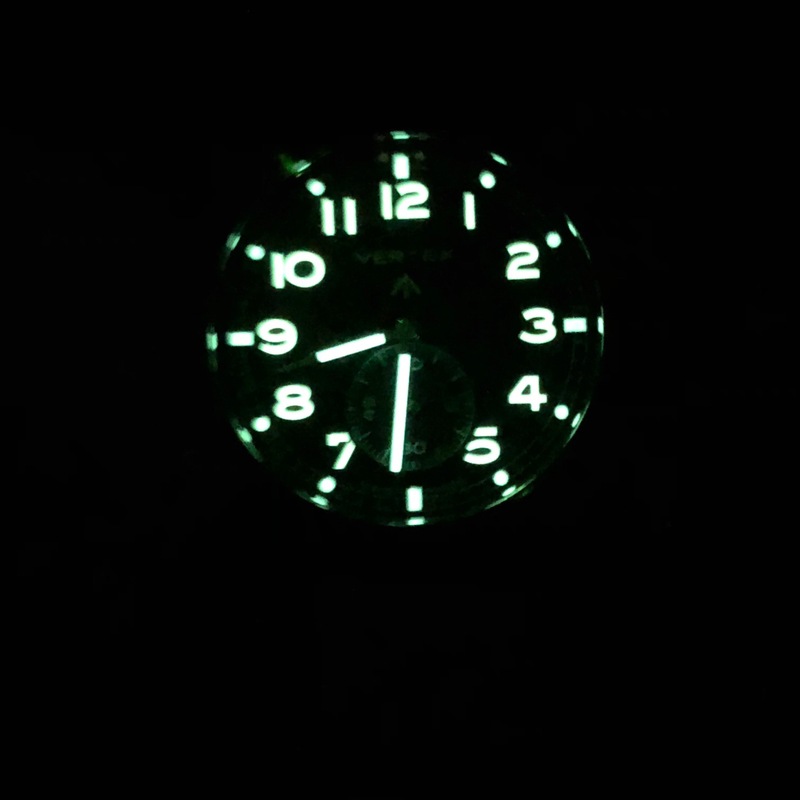 Then of course there is still the amazing lume…. In conclusion this watch is a great compliment to the original with the advantage that you do not need a recommendation to buy one. 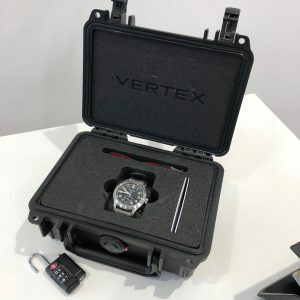 For more information and possibly to buy one visit the Vertex website. 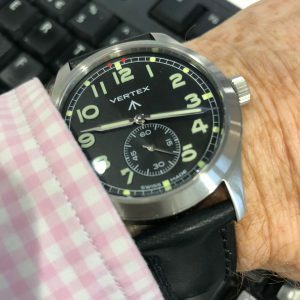 Vertex is not the only British brand to make their watches in Switzerland, but when I was thinking of a watch that would make the perfect companion on my family ski trip, it was the first watch that came to mind. The first reason being the new M100 is clearly a watch made to wear when doing stuff , a robust military style tool watch. Secondly, I liked the idea of taking the watch back home. Fortunately, Don Cochrane, the founder of the brand, was happy to lend me one. During the Second World War the British Military selected Vertex, along with eleven other leading watchmakers, to supply the army with a new watch built to an exacting bespoke design. The specifications were precisely what you would expect of a military watch – waterproof, luminous, regulated to chronometer level and rugged. On top of that, the dial needed to be black with arabic numerals to maximise legibility. This select group have became known as the ‘Dirty Dozen’ and are highly collectable. 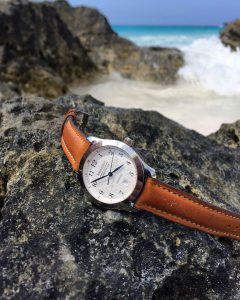 Don Cochrane is the great-grandson of Claude Lyons and proud owner of Vertex Watches. His passion is to continue his great-grandfather’s legacy and pay tribute to these watches through the new Vertex M100, produced in Switzerland with significantly more attention paid to their manufacture than their predecessors made for the Ministry of Defence. 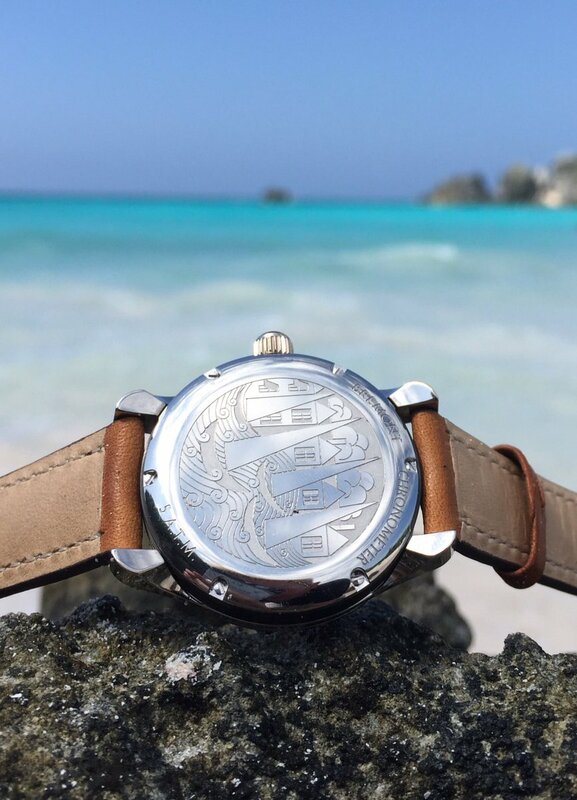 Custom ETA 7001 mechanical movement with rhodium finish and Cotes de Geneve decoration. Brushed steel case, box crystal glass, waterproof to 100m. Hand wound with 42 hour reserve. Black dial with arabic numerals to maximise legibility, in homage to the Vertex W.W.W watch of 1944. 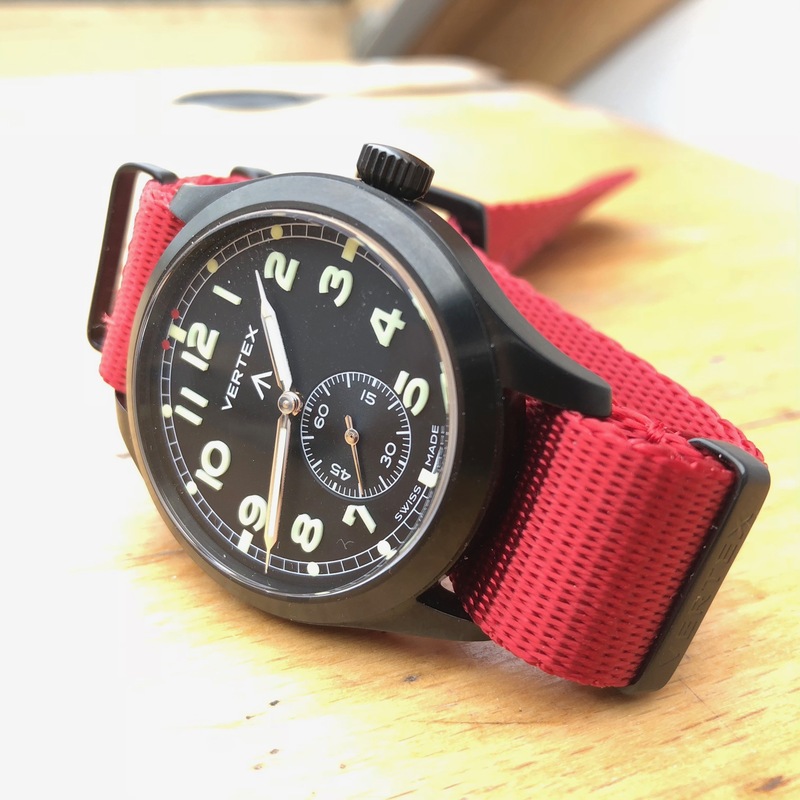 Packaged in a Peli case with two straps – a black leather two-piece strap, with contrasting red lining and a bespoke nylon NATO-style strap in Admiralty Grey. 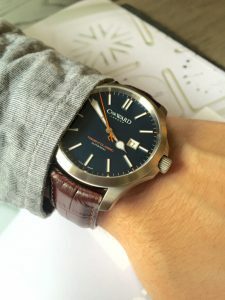 An attractive package, but there is a catch, to be able to buy one of these watches you either have to be the owner of one of the original watches or be referred. The first time I actually saw and touched one of these rare watches was at the pre-Salon QP Watchmakers Club evening. 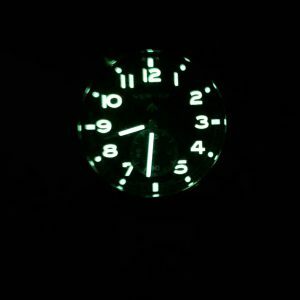 Once over the initial excitement of seeing and handling one, the next thing you cannot fail to notice is the amazing lume on the numerals on the face, it is really very thick. The M100 comes in a distinctly non-retro box, a Peli case, which you could realistically use as a travel case. The watch arrives with two straps, a grey Nato and a more conservative black leather. 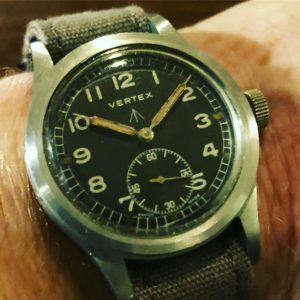 When I first discussed the watch with Don the first point we discussed was the 40mm case size, would a smaller case not be a more faithful reproduction of the orginal watch ? Maybe, was Don’s reply. Though as you will see from the images above the the more “modern” size wears well even on my scrawny wrist. For a bit of variety Don also gave me a choice of a couple of their accessory nato straps. I picked one green and one a steel grey. 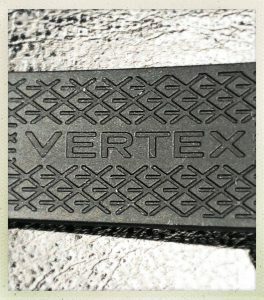 These straps are made of nice thick fabric with Vertex branding on the keepers. Unfortunately, for me I found these really nice straps too long for me. Which left me using the standard issue nato strap. Thanks to its manual movement the M100 rewards the wearer with the opportunity for a moments contemplation when you reach for it in the morning to wind the mechanism. One of the reasons many of us enjoy owning a mechanical watch. 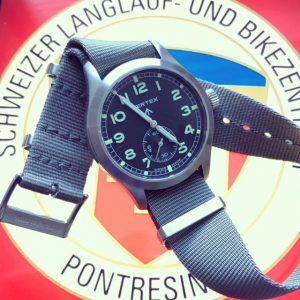 Before leaving for Switzerland I wore the watch every day on the nato strap and could easily imagine being my “one watch”. 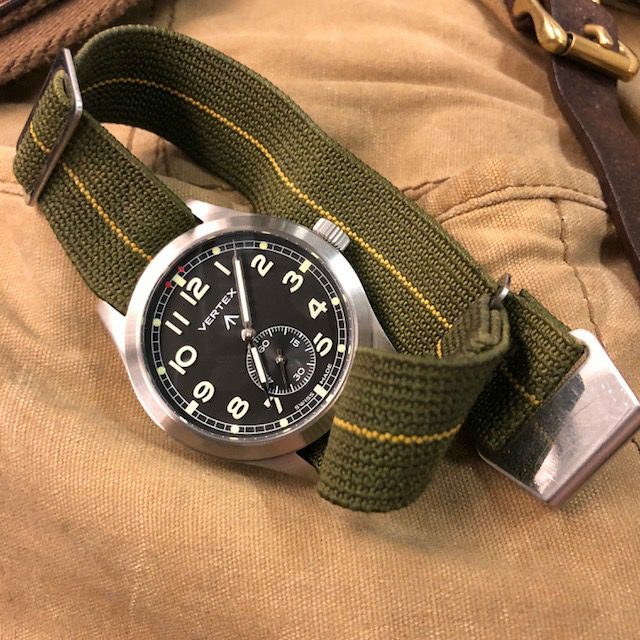 Whilst packing my bags for the week I wondered how the watch would suit my MN strap, after all both the watch and the strap are “military” style. I think it worked really well, so kept it like that for a week. This combination proved to be the perfect companion on the ski trails; this week I was trying Nordic skiing for the first time. The watch being being really legible in all conditions. 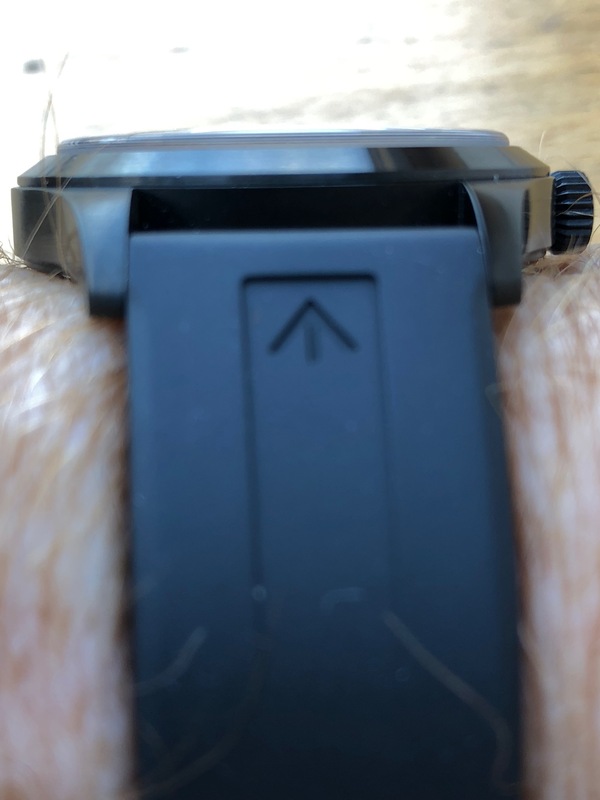 The “not huge” case allowing the watch to slip easily inside the different layers of winter clothing and elastic of the strap meaning I never had the crown digging into my wrist. 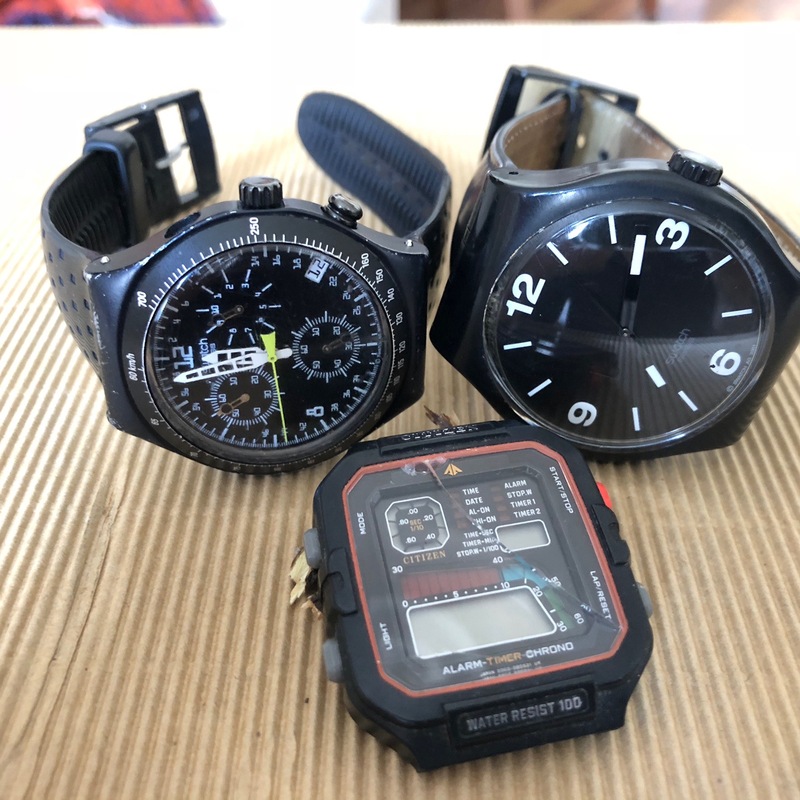 The style of the watch does not give the wearer the opportunity to show the world how wealthy/macho they are like some more instantly recognisable brands. 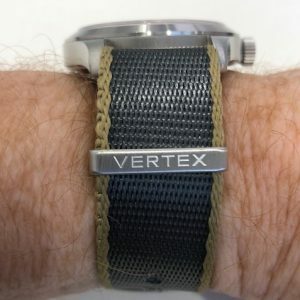 The wearer does though get the satisfaction of being “in the know” being part of the Vertex community. This “community” is the clue to Vertex brand. When I returned the watch to Don he explained this was how he wanted people to experience the brand, he did not want people to buy into the brand just by writing a big cheque. He wants people to have to make an effort to get one of his watches. This brings me back to why I started writing my blog in the first place. Why do people buy one watch rather than an other? 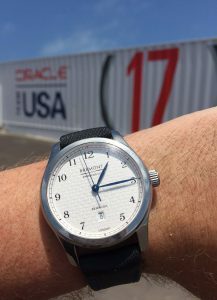 As I have commented previously there are companies like Bremont that are constructing heritage through their various special editions and military collaborations. The Vertex approach is a more subtle, slow burn strategy. 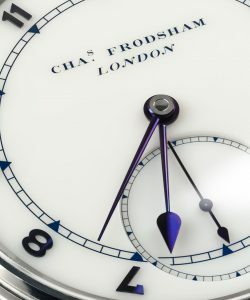 It will take longer to see whether it is a successful strategy, but assuming the watches Don produces are well accepted by the watch buying public and people do actual bother to make the effort required to possess one he could up with a solid brand based entirely on its own products; with a strong community of fans. From a purely business/marketing point of view I wonder what the numbers might need to be to make this strategy sustainable . It is however a very interesting approach that you could easily applied to other product categories. So it was with some regret I gave the watch back, I had already been doing the “man-maths” to work out how to pay for this addition to my collection. The good news is that Vertex are working on some further launches, which will enable a few more people to join the community. Watch this space if you can excuse this pun. To find out more you can visit the Vertex website. I wrote about this watch coming up for auction at the end of last month. The estimated sale price was £70-100,000. 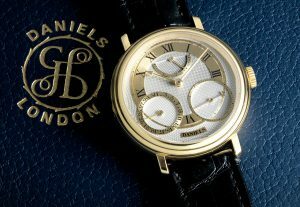 Well the sale was yesterday at the watch was sold for £225,500 including premium!!!! 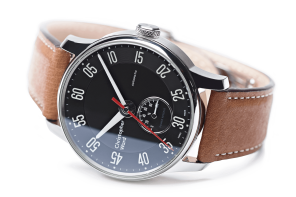 I read this article as it was giving the Hodinkee team’s view on this limited edition watch from Christopher Ward. The article gives the usual balanced assessment of the watch but then goes onto make some observations about the appropriate linking of limited edition watches to other prestige brands/products; in this case a very special Aston Martin. I think they have a point there does seem to mis-match between the the watch and the car. There could also be another way of looking at the thoughts behind the watch. It could be that the people at Chr. Ward came across an opportunity to obtain material from this much admired car and came up with this way of using. I will have to get in touch and see if they can tell me what the truth is. 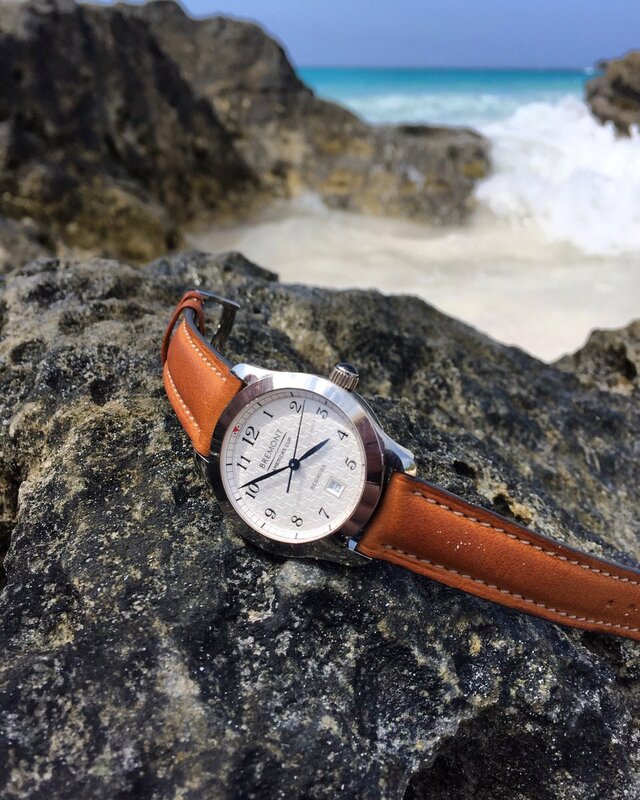 Mike Pearson of Bremont North America tweeted this intriguing pictures of this “Bermuda limited Edition”. Intriguing because I cannot find any other mentions of this watch anywhere else. I would be curious to know how many will be made and for who? Up-date: I have read this is the ladies size AC-32. so even more interesting, a limited edition watch in a women’s size. Update : Mike Pearson tweeted another picture this time of a companion limited edition men’s watch for Bermuda based on the AC1. This slightly ruins the thread of my previous post. Having said that this is another handsome looking piece. 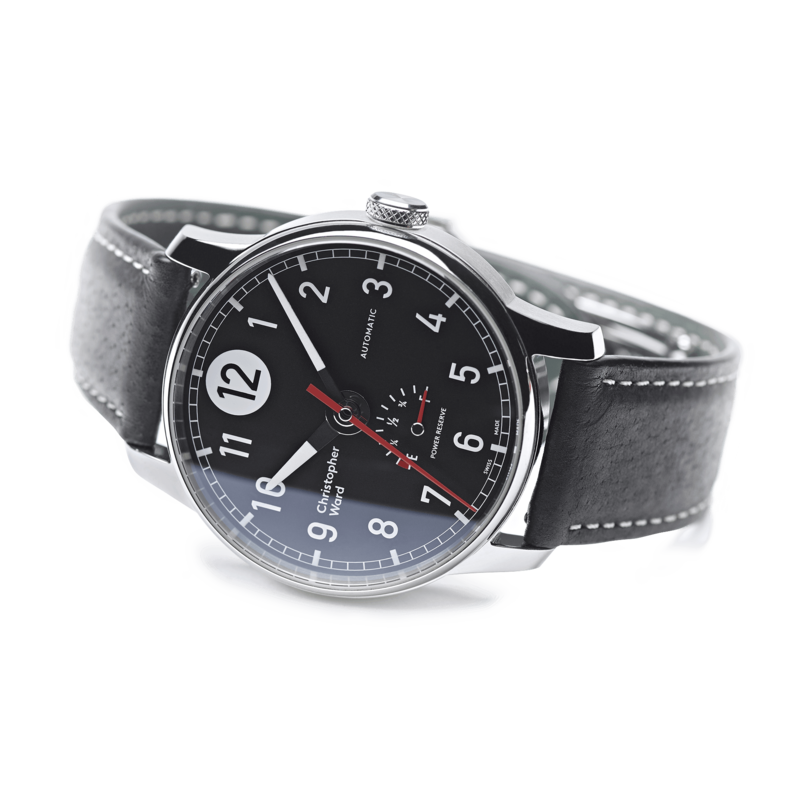 I am however loosing track of the number of limited editions Bremont are producing. 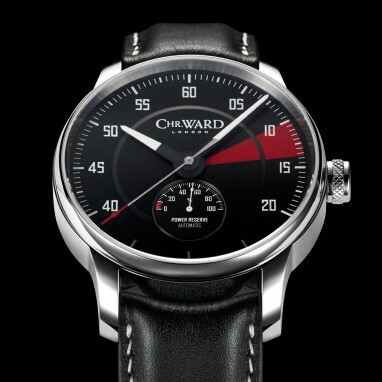 If like me you preferred the look of the old Christopher Ward logo then all is not lost. This week saw the announcement of a limited edition of the C65 Mk1 featuring the old logo. 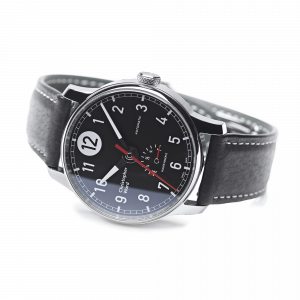 Christopher Ward have announced a new limited edition watch which appears to be following the Bremont lead of adding bits of “precious” material to add “heritage”. In this case they are including metal from a GT40 car. This is what they have to say about it. With only 40 pieces produced of this significant watch, we expect to be flooded with demand for each piece. Use the below link to pre-order your C9 GT40, and contact Wera Mettes (wera.mettes@christopherward.co.uk) if you wish to reserve your preferred serial number (#1-#40) on a strictly first-come, first-served basis. 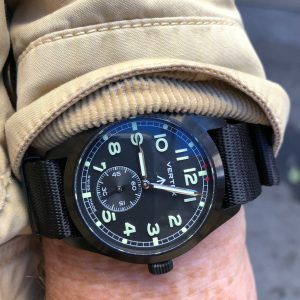 It has taken me sometime to get around to assembling this post which is a shame given the “Britishness” of the watch in question the C8 P7350 a limited edition tribute to the Spitfire Second World War fighter. If you want one you have until the end of June to get your order in, assuming they have not all gone already. Here is what Christoper Ward have to say about it. They say the joy of travel is in the wandering. 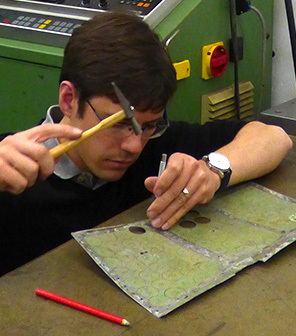 Facing the challenge of creating a 75 piece Limited Edition watch fit to contain a real piece of British history – a piece of original Duralumin taken from the cockpit of the last airworthy Spitfire that flew in the Battle of Britain, P7350 – we knew we had to leave no avenue unexplored in creating a process where every component piece was brought to life meticulously, by hand, and with the attention to detail deserved by such an important object. In this watch, then, the centerpiece is not just Calibre SH21 (the in-house movement which for the 1st time is built and COSC certified in a hand-wound execution) but is actually a blunt piece of Duralumin metal only just thicker than a good old piece of writing paper, sourced for us by our good friends at TMB ArtMetal. The comparison ends there, where there is only one sheet instead of an entire block of writing paper sheets. Moreover that sheet has punched holes, signs of distress and age and is only just large enough to offer the 75 medallions needed to be cut out on condition that a) you do it smartly and b) there is not the slightest wastage. All of the above might make you or I a little nervous; but not so – luckily – Johannes Jahnke, our man not only for construction of our already famous movement but also of the handful of JJ Calibres already enhancing a number of our watches. The trick Johannes plays is having a road map in mind of how to get the job done; something quite useful in general, even in everyday life. So in order to prepare himself for the challenge of creating 75 perfect discs from just one precious piece of 75-year-old Duralumin, he buys a piece of metal, cuts it into a similar shape, and bangs and tortures it until it has the same rugged looks as the original. 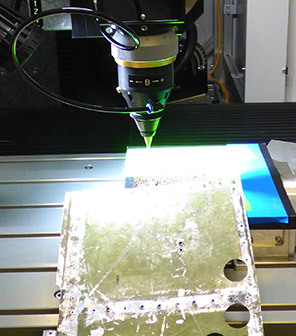 Then, he works out with the engineer at our local laser shop the individual process steps. No alley or byway is left untraveled in this labyrinthine, yet rigorously logical, journey in thought process. For example, the fixation so that the laser will cut regularly, neatly and the medallion actually will be round otherwise, you imagine correctly, it won’t fit into the caseback opening – which I assure you, is round! 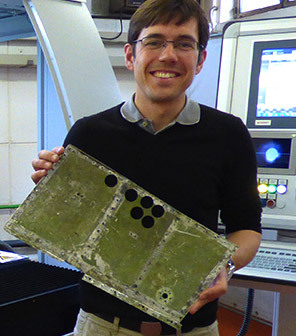 In parallel, while Johannes is working away at the laser lab, all the C8’s distinctive components arrive in our Biel atelier and Brigitte, who is in charge of quality at Synergies, takes special care of all individual parts in order to assure that this very important project (to us and to you as our customer) gets the attention it deserves. Above you will see a batch of COSC certificates and several movements. You may note a number on the plastic case in which we must deliver the movements to COSC and which is identical to the number engraved directly onto the main plate of the movement itself. Also you may have questions regarding the dial and hands on the movement. This is a working dial and working hands specially made for the COSC certification as per the conditions of COSC. Once the movements are certified and returned we will then remove these hands and dial – to use them again in a subsequent certification – and replace them with the proper components for the C8 P7350. Since with this COSC application we were having a hand-wound movement certified for the first time, there was a bit of suspense hanging in the air regarding the outcome. However, we did great as we passed well over 90% of the first batch submitted and thus – TMB here we come – we can arrive at our destination feeling confident that the quality of the movement and componentry is a fitting tribute to the importance of the historic backplate it beats beneath.